Bio-Propolis is manufactured to the highest quality GMP standards. Bees mix plant exudates with beeswax to make propolis, a paste that can be smoothed over the inside of the hive. Propolis makes the hive more secure and simultaneously provides an antiseptic coating, reducing the growth of bacteria, viruses and moulds inside the hive. Mankind has adapted this useful material to his own medical needs. 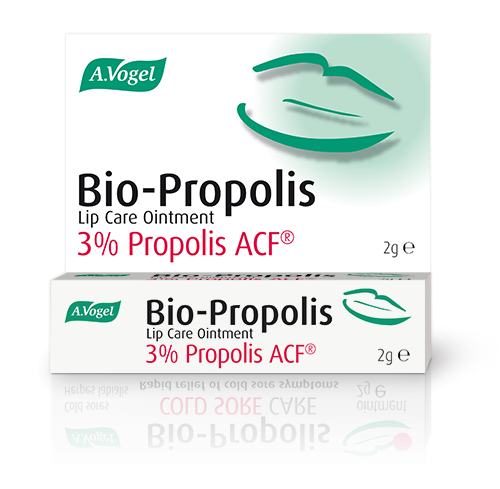 Bio-Propolis Cold Sore Barrier Ointment is formulated with carefully selected skin protectives and Propolis extract. Bio-Propolis Cold Sore Barrier Ointment is contains a patented propolis extract collected from the hives of bees that feed on a special variety of Canadian Poplar Trees. Bio-Propolis can be used at any stage of the cold sore's development. It is designed to be rapidly applied to soothe the cold sore area and form a protective barrier to the elements, allowing the skin's healing process to go to work and return the affected area to a healthy condition. Propolis is rich in amino acids, trace elements and flavonoids, which work synergistically to provide the antiseptic, antibacterial and antifungal effect. Propolis inactivates the Herpes Simplex virus which is responsible for cold sores, stopping it from replicating and at the same time reducing the likelihood of bacterial infection around the site of the cold sore. Its local anaesthetic action means the cold sore will be less painful, and studies have shown that healing time can be cut by as much as 50%. Propolis can also relieve symptoms even when applied after the tingle stage. Ointment containing 3% Purified Propolis Extract ACF® (Active Complex of Flavonoids), white petrolatum, liquid paraffin, lanolin and ethanol.